Hey all, just curious if anyone knows if the HTA says anything about someone on a highway using the acceleration/merging lane (not the shoulder) to cut in front of other vehicles during a traffic jam. 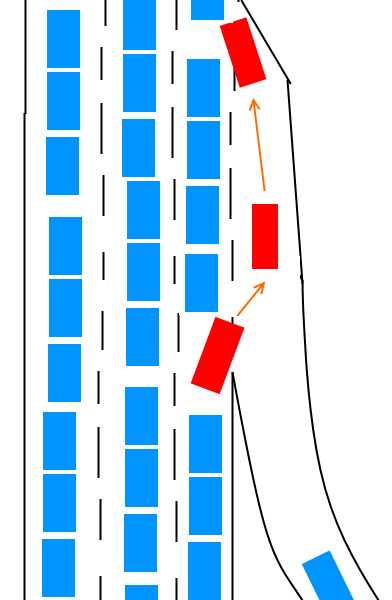 I am stuck in traffic all the time during rush hours and see many drivers do this. Other than making everyone else hate you, are there any issues with this from a legal point of view? As long as they follow section 142(1) there's nothing illegal about it. Thanks for the reply. Just to clarify, the HTA doesn't mention anything specifically about the following behavior (red car), so long as it isn't done in a dangerous manner?